The Futurelooks Team barely made it to CES 2014 this year. With just weeks to go, and few bodies (two actually), we set off to cover the biggest tech show in North America. Joined by our friends at MEGATechNews (who turned out some awesome Non-PC DIY related coverage of their own), we ran from one end of the strip to the other to find all the "Stuff for people who like computers" all week long. Now that we're back on home turf, we're cranking out the video coverage that you all know and love. May I present to you, Episode One of our CES 2014 video coverage in glorious 1080p HD! If you're having problems viewing the video, you can view it right here on our YouTube Channel. For those that like to skip around, here's a quick program guide. (00:26) - InWin shows off their latest 900 series cases that feature a single 4mm wrap around shell, covered by tinted tempered glass panels. The 904, which was launched last year, retails for around $280US MSRP and fits full sized components and ATX motherboards. The 901 version is geared towards mini-ITX builders, but still provides enough room for large graphics cards, full size PSUs, and has plenty of room for cable management. This equally stunning case retails for around $190 US MSRP. (02:15) - GIGABYTE shows off their new BRIX Pro mini systems. They'll be launching two new Haswell versions with a taller chassis to help accommodate the option for a 2.5 inch hard drive (in addition to the internal mSATA). The Core i7 version will come in black and retail for $649.99 US while the Core i5 version will come in red and retail for $529.99 US. Both of them use Intel's latest IrisPRO 5200 graphics that is capable of driving 4K displays. There's a bit more info in the official press release. GIGABYTE also showed off prototypes that use more powerful discrete graphics solutions from both AMD and NVIDIA. Speaking of which, GIGABYTE's team was also toying with the idea of using mini-SAS to allow expansion of more powerful external graphics solutions. This is different from the track that other companies have taken, using Thunderbolt2 instead. The GIGABYTE engineer did say that Thunderbolt2 was good, but this was better. We'll bring you more info as soon as we have it. Because they launched all their new motherboards already, we'll have to wait till COMPUTEX 2014 to catch up with them on those products. (05:52) - ADATA was showing off three new products including a 2TB 900 series SSD with an LSI controller inside, their DDR4 certified modules, and their PCI-Express M.2 SSD prototype. There is no pricing or availability for any of this at the moment, but isn't nice to see the PC DIY version of M.2 handing it to the new Mac Pro with over 1800MB/s of transfer? PC DIY FTW! (07:15) - be quiet! has always been known for premium products. And although the premium price has not slowed down their sales in North America, the company has recognized that they need entry level products to get people hooked. At CES 2014 they unveiled their first entry level price point products which include new PureWings2 fans starting at around $10 US. They've also brought in a new ShadowRock2 series that addressed both costs and the ability to be mounted with aggressively designed RAM modules. At the top, the DarkRock 3 series is even bigger with a Pro model and a slightly smaller unit, which improved fin design that drops temps even further than their predessors. Finally, be quiet! has brought their German engineering to two new form factor power supplies including the GFX and SFX. Both will come in various wattages but only the GFX version will come in an 80PLUS Gold rating for now, citing costs to manufacture. Their goal is to have both form factors out there for price points under $100 US, which should give DIY builders a lot more options to realize their custom system dreams. (10:40) - Silverstone has a slew of updates including new GD10 and GD09 models, slim gaming cases that are a perfect fit for that new Steam Machine build, and new RV (RV05) and FT (FT05) series cases that return to the 90 degree motherboard design they are known for. The SG series isn't left out either with a couple of long awaited updates in the SG11 and SG12. (24:50) - Steelseries unveils a new wireless gaming mouse called the Sensei Wireless. Based off their Sensei mouse design, this unwired rodent offers up to 16,400 DPI performance, and can be charged via micro-USB or through its included dock. You can find out more about it in the official press release too. 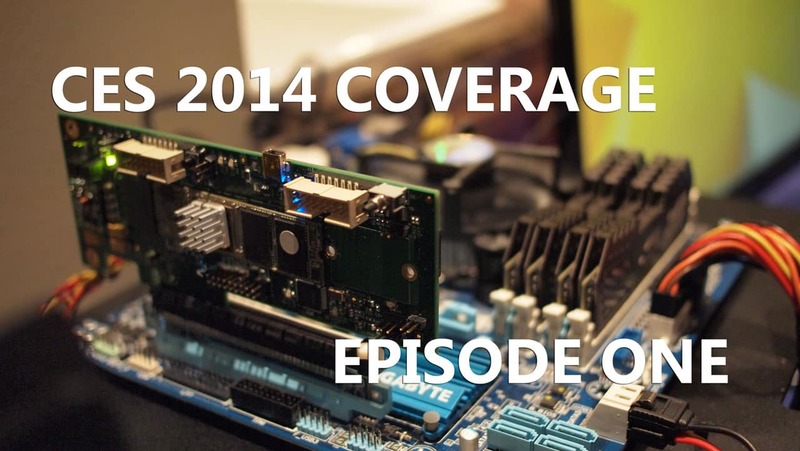 And that's Episode One of our CES 2014 Video Coverage. Stay tuned for Episode Two coming up really soon. In the meantime, please enjoy the plethora of news stories that our news team has put together from the show. Our friends at MEGATechNews also have a good helping of news stories from CES 2014 to share as well.